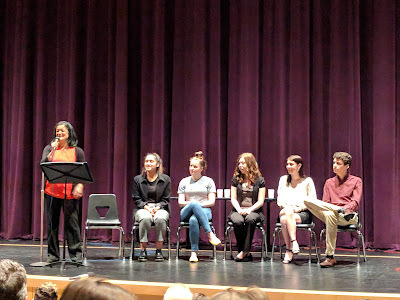 Today with other members of Central Seattle Moms Demand Action For Gun Sense in America, I attended a Town Hall featuring our WA-07 Congressional Representative Pramila Jayapal (progressive rockstar!) and a group of high school students who are organizing the March for Our Lives Rally & March next Saturday the 24th. 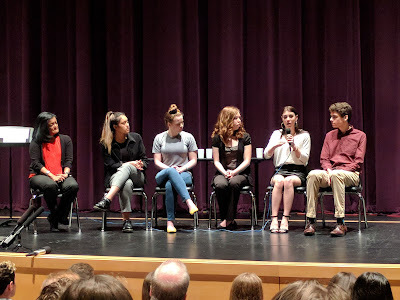 It was a Gun Violence Community Forum and an opportunity to meet these local teens from Ballard, Roosevelt, Rainier Beach, Ingraham & Tahoma High Schools. Some of them were also instrumental in organizing the gun reform walkouts and other protest events earlier this week on March 14. But they each spoke about what made them want to step up and motivate others to call attention to and make gun law reform. These students fill my heart with such pride, determination and resolve. This engaged and articulate generation is going to rock our world--for the better. They spoke about how they are sitting targets in their schools while many politicians, the gun lobby and the general public have traditionally done little to nothing to change that. They spoke about how the lockdown drills and false alarms at some of their schools have created a heightened anxiety in everyday student life. One spoke through tears about her younger autistic sister and how when stressed the little girl gets louder, not quieter. If a school lockdown situation arose and the young girl had to hide and keep quiet, she literally could not do it so the greatest fear is that she would be an easy, locatable target. One of the students mentioned how when she first heard of the Parkland shooting that she was numb and it was just another day in America, but something in her reached the breaking point. She watched her peers in Parkland rise up, use their voices and get vocal. This young woman, Scout Smissen, helped organize the event on March 14 where local students marched to Red Square at the University of Washington. She mentioned how some adults would have preferred if they had just observed 17 minutes of silence and returned to their classrooms, accepting and normalizing gun violence, but she said, it's more important that they get LOUD. "Your right to own a gun should not override our right to live." There will be 4 million newly-minted voters in the 2018 election. Candidates need to be on the right side of history and right side of humanity if they wish to keep their jobs. Gun reform and gun sense is front and center. WOw, great kids. Lets hope they have the power, we adults seem to be lacking.